Warlord Games once again returns to their Hail Caesar line and reinforces it with some more Bronze Age squads, including slingers and axe-men. This week we have more new miniatures from the Cutting Edge Bronze Age range. 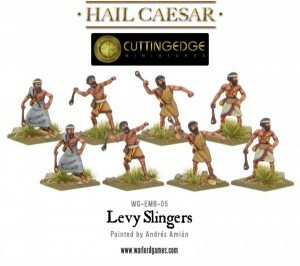 Following on from the miniatures we released for the Sumerian and Akkadian armies last week, the next release for our new Early/Middle Bronze Age range widens your range of troop options with slingers, axemen and archers.